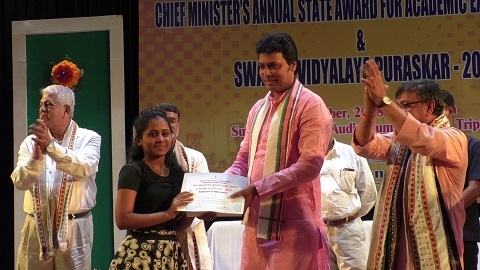 All total 79 students from 36 schools were awarded iPad (Apple tablet) during the Chief Minister’s Annual State Award for Academic Excellency 2018 and Swachh Vidyalaya Purashkar 2017 in Agartala on Saturday. Organized by the School Education Department, the annual award programme, first of its type in the State, was inaugurated by State Chief Minister Biplab Kumar Deb along with the Education Minister Ratan Lal Nath and other dignitaries by lighting lamp at the Sukanta Academy auditorium in presence of hundreds of students and parents. Students from various schools who were among the five top in class X and XII board examinations beside those who scored the highest mark in various subjects were awarded so that they are encouraged and side-by-side others students are motivated seeing their success. The awardees were very happy to get the prize for their hard work and they appreciated this initiative which is totally new in the State and introduced by the new government under the leadership of Chief Minister Deb. Meantime, Deb expressed that this award has been introduced to encourage the talents and motivate other students who are going to play a major role in the coming day in transforming the nation and the State as well. During the same programme, representatives of various schools of the State were also awarded for cleanliness under the Swachh Vidyalaya Purashkar 2017.